Premiered at New York Creative Technology Week 2016. Produced by Classic Stage Company. 2014/2015 Season. Produced by Keen Teens Festival of New Works. 2015 Season. Additional support from The Juilliard School's Center for Innovation in the Arts. Premiered in Beyond the Machine 18.1 at The Juilliard School 2018. Premiered in Beyond the Machine 15.1 at The Juilliard School 2015. 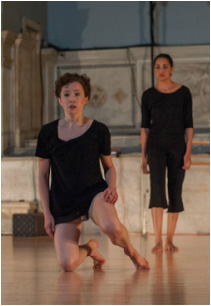 Premiered at Judson Memorial Church 2014. Premiered at The Tank 2015. Eco-friendly creation; unplugged light and sound design. Premiered at HATCH Presenting Series 2014. Premiered at The Juilliard School 2011. Choreographic Honors. Premiered at The Juilliard School 2011. Also presented by 92nd Street Y 2011. Premiered at The Juilliard School 2010. Choreographic Honors. Pete Anderson, saxophone; Will Anderson, saxophone; Kyle Athayde, trumpet; Eddie Barbash, saxophone; David Baron, bass; Alexandra Beaty, dance; Joe Boga, trumpet; Joshua Crumbly, bass; Phoebe Dunn, actor; Morgan Jones, saxophone; Carson King-Fournier, trombone; Phillip Kuehn, bass; Chad Lefkowitz-Brown, saxophone; James McBride, percussion; Clovis Nicolas, bass; Jordan Pettay, saxophone; Samora Pinderhughes, piano; Adrian Rosas, bass-baritone; Michelle Ross, violin; Joe Sailor, percussion; Enrique Sanchez, trumpet; Stephanie Sutherland, dance; Caleb Teicher, dance; and Kerry Warren, actor. Photos: Eric Bandiero (top), Jim Metzger (sides), Patrick T. Rousseau (middle left), Jill Steinberg (middle right).